Although many people go 'cold turkey' when they switch to a low-carb diet (ie: long-term lifestyle vs quick fix weight loss programme), a steady reduction can also be a good approach. Cutting out the middle of your 3 piece hamburger bun takes out 25 grams of carbs and since it's the fat in the burger(s) which makes you feel full, most people don't miss the piece of bun. Cut out the fries and you're making major headway! "If the case for LCHF is so strong, why aren't more governments heading in that direction?"... you may ask? For obese individuals, Mediterranean diets (with extra olive oil and nuts) may lead to a reduced risk of onset of cardiovascular disease or death caused by cardiovascular disease, compared with low-fat diets. Low-carbohydrate diets, including strict ones, may lead to greater weight loss than low-fat diets in the short term. A high intake of full-fat dairy products may lead to weight loss in obese children and adults. These are carefully worded outcomes, but together with other recent research outcomes, they're beginning to add up. "Do I need carbs to live?" If you're studying to be a doctor, you'll learn of the important role that carbohydrates play in giving you energy and in building cell walls etc. But the well documented examples of the Inuit tribesmen who ate zero carbs (90% fat) for more than half the year and yet were fit and strong speaks against that. In this context, LCHF diet fans make reference to an early proponent, the Icelandic-Canadian explorer Vilhjalmur Stefansson (1879–1962), who lived with the Inuit for some time and witnessed their diet first hand. From 1906 until 1918, Arctic explorer Vilhjalmur Stefansson ate almost exclusively fish and seal meat, often raw or fermented, and almost no vegetables - living as an Eskimo among Eskimos. He concluded that he had never been in better health in his life and concluded that: “… wild meat/fish is better than citrus for scurvy, that meat is excellent for the teeth, that exclusive meat diets increase health, and that humans may have no need for varied diets with vegetables & fruits.” His article written for Harper’s Monthly Magazine in 1935 can be read here. He and a friend later volunteered for a one year experiment at Bellevue Hospital Center in New York to prove they could exist on a diet of meat, fat and the internal organs of animals. Their progress was closely monitored and at the end of the year, he did not show any symptoms of ill health; not even having developed scurvy, which many scientists had expected because of the lack of vitamin C in their diet. Most LCHF proponents do not try to demonise carbs; they just like to make us all aware that the carbs we get through eating vegetables and nuts are more than sufficient to keep us going. You can find out much more about LCHF at The Diet Doctor's blog. In 2004, Dr Ann﻿ika Dahlqvist was a relatively ﻿obscure General Practioner living in Njurunda, Sundsvall. But in the autumn of that year, she discovered how a diet low in carbohydrate could help her in the areas of both obesity and ill health. For some while, she had been suffering from symptoms which you and I would loosely describe as Irritable Bowel Syndrome. She was also experiencing chronic fatigue syndrome, insomnia and (to be complete) she snored! All of these ailments or illnesses disappeared pretty quickly after she dropped most of her carbohydrate intake and increased the proportion of natural fats in her diet. “I realized that these mechanisms should also be able to apply to many other people, and therefore began to spread my experiences via e-mail contacts and letters to newspapers describing my diet program” she says. In autumn 2005 she started her first blog on the subject and since then, has written thousands of blog posts about carbs, and also linked to many reports and research papers on science, health benefits, etc. Since May 2011 she has also been writing her WordPress blog at (http://annikadahlqvist.com/om-dr-annika-dahlqvist/); mostly because she was getting irritated by the amount of advertising on her previous blog. The last few years have been tumultuous for her. She lost her job at the Njurunda Medical centre, in November 2006, because her LCHF diet recommendations were not in line with the authorities. In spite of this she received more and more media attention about her diet and in January 2008 the Swedish national authorities finally approved her low carbohydrate diet, and assessed that it was "in accordance with good clinical practice". The evidence was simply too convincing. She began to travel the length and breadth of the country givin lectures on carbs and wrote several books on the subject. The autumn of 2009, was a turning point as she tackled another public health issue, arguing against the mass vaccinations for swine flu, which had been initiated across Sweden. This time, the media were not so supportive believing that vaccination was vital. Her star fell and she was suspended from her work at the Primary Care Shelter in Västernorrland County Council, and considered by many to be a dangerous person. But the LCHF message survived, due to its growing reputation in the fight against obesity and success tackling other health-related issues. Finally, she was vindicated; it turned out that she had been right when it came to mass vaccination, and she has now regained work, currently being employed at the Health Centre in Sundsvall. 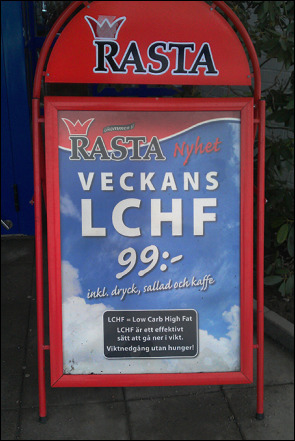 At her Swedish language blog, she says the following: The "Food establishment" consisting of nutrition professors and nutritionists in recent years has gone on the counter-attack against low-carb diets, which turn their own low-fat high-﻿carbohydrate diet model that has prevailed for 40 years upside down on. They are supported by the food industry and the pharmaceutical industry which both continue to make money from it. You cannot accuse Dr Ahlqvist of shying away from a fight but as time goes on, the ball seems to be more often in her court.